This case study is about the bioremediation of industrial wastewater, specifically the bioremediation of chicken processing wastewater. Food processing wastewater is one of the most common industrial wastewater problems that we work with at Custom Biologicals. F-TREAT is the product highlighted in this case study. F-TREAT is a biological wastewater treatment product designed to reduce FOG, reduce BOD and COD, reduce odors, and reduce sludge at industrial and municipal wastewater treatment facilities. F-TREAT contains specifically selected bacteria. These bacteria have been selected because of their enhanced ability to metabolize the organic components at wastewater treatment plants. Problem: The protein conversion plant (rendering plant) has a LAS permit (Land Application System Permit) that allows the rendering plant to spray the treated water from the final settling pond onto fields at a rate limited by the phosphorous levels in the water. The phosphorous level was at the maximum allowable limit. Previous Treatment: Chemically treated for reduction of BOD and grease. There was not a phosphate removal system. Custom Treatment: An initial “shock” treatment of 110 gallons of F-TREAT with a daily application of 20 ppm of F-TREAT. The initial sludge analysis showed phosphate in the amount of 448.03 mg/L. Custom Results: Also, the average sludge reduction was 12 inches in the final settling pond with some reported reduction up to 26 inch as measured by a “sludge judge”. 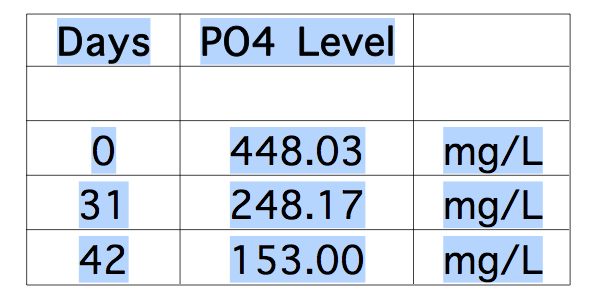 Note the significant reduction in PO4 level. This has been a case study about the bioremediation of chicken processing wastewater, a form of industrial wastewater. In this instance, F-TREAT, a bioaugmentation product, was added to the effluent to effectively treat the wastewater. Contact Custom Biologicals to talk about how F-TREAT can solve your industrial wastewater problems. Custom Biologicals manufactures a wide variety of biological products for use in environmental applications.